Registration now open for Neurosurgical Training Camp 2019! 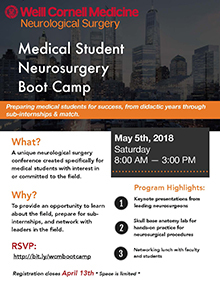 The medical student program for neurological surgery is a robust collaboration among academic affairs and the AANS medical student chapter at Weill Cornell Medicine. Through this effort, Weill Cornell Medicine Neurological Surgery boasts a thriving medical student community with ample opportunity for career exploration, mentorship, research, and entry level training that optimally prepares our students for transition to residency training. Dr. Susan Pannullo is the faculty advisor for the Weill Cornell Medical Student Chapter of the American Association of Neurological Surgeons (AANS); our students at Weill Cornell Medical College have developed one of the most active AANS Medical Student Chapters in the world. The group pioneered our signature Medical Student Neurological Surgery Boot Camp, among other initiatives.